If you were engrossed by last week’s Apple announcements, you may have missed the fact that the Android Market was renamed to the Google Play Store. The Big G felt the move would better reflect the content available, which now includes books, movies, music and apps. With 850,000 daily activations (as per the ever-boastful Android chief Andy Rubin), Google needs to make sure its retention rates are equally as impressive. Despite enjoying a greater reach with its Android OS compared with rival Apple’s iOS, it’s generally accepted that content is easier to obtain from the vaster App Store, prompting developers to favor the Cupertino company’s online portal. Indeed, developers are hardly going to leap onto the Android platform considering the current situation, which has seen devs complaining about delayed revenue payments from Google. Europe-based software coders have besieged forums in recent weeks, arguing that their February fees had not been received on 7 March as scheduled. Still, even with the developers up in arms, Google has released a new build of the Google Play Store app (build 3.5.15), which is now available for download. Features include a new tabbed interface in the "My Apps" section, as well as more concise, informative app reviews, which allow you to see the specific device of the person leaving the review, as well as filter your search results by device. Seeing as the Google Play Store is still in relative infancy, the likelihood of regular updates such as this are high, and if each revision turns up a couple of useful new features like this one has, Google’s vision of a well-functioning, streamlined content center could certainly bear fruit. Will it be comparable to the App Store in terms of content and usability? Only time will tell; but removing the Android branding in favor of Google is certainly a step in the right (PR) direction. To install, simply overwrite your current Google Play Store. Once installed, be sure to let us know if you uncover any hidden features or bugs by dropping a comment on our Facebook or Google+ pages. 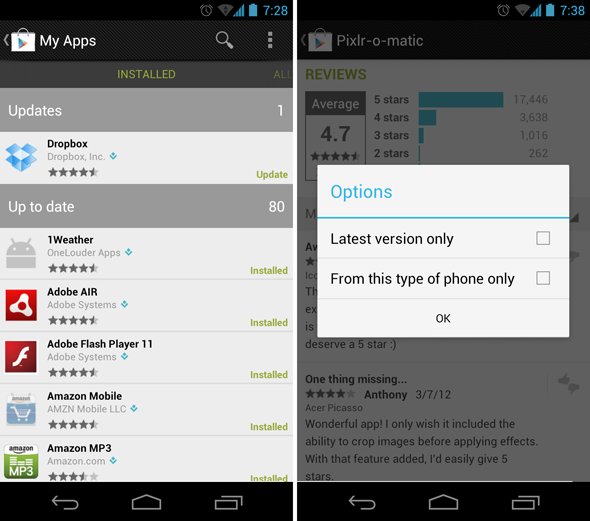 How To Get Google Play On Your Android Device Right Now!